Want to entertain more this summer? 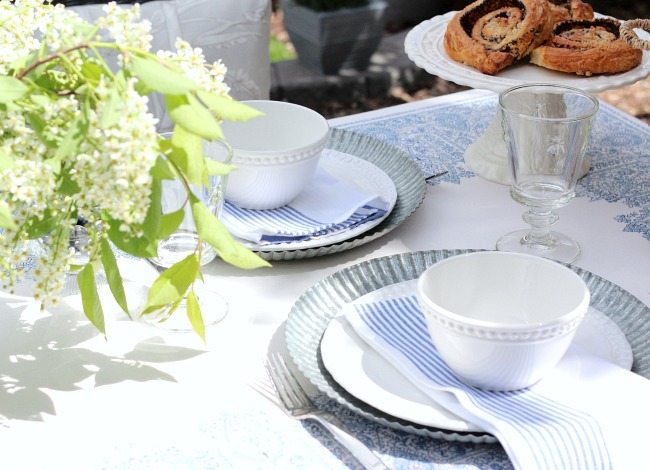 Get these simple tips for putting together a casual and beautiful outdoor brunch table setting. 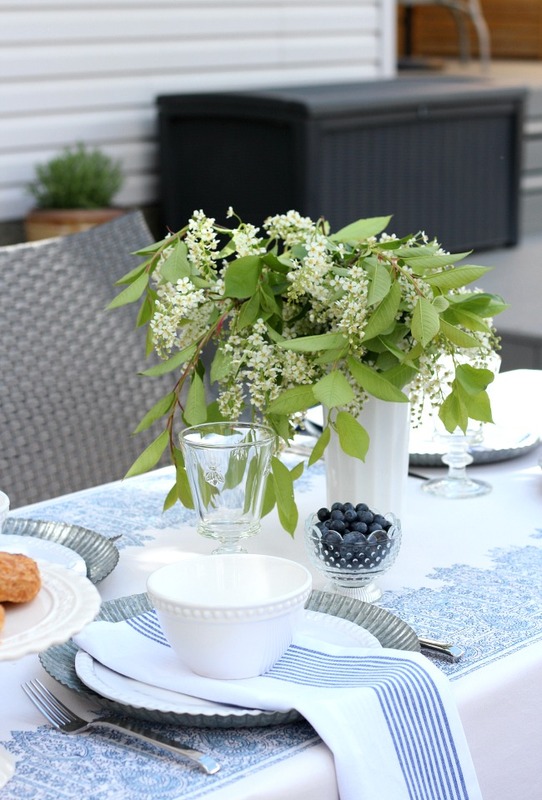 Thank you to Wayfair.ca for collaborating on today’s post and helping me share my ideas for putting together a casual outdoor brunch table setting. Hello everyone! We spent most of the gorgeous long weekend in our backyard getting it whipped into shape for summer. Although we still have a bunch of staining to do, I’m happy to report the rest of our yard is looking pretty darn good. To say I’m a bit stiff from reworking our garden beds and topping them with a truckload of mulch is an understatement! Creating a beautiful outdoor space definitely tops my list of priorities this time of year. Perhaps it’s living in Canada where our outdoor season is far too short that motivates me. Or, maybe, I simply enjoy reconnecting with nature. Sunshine and fresh air do wonders for me! 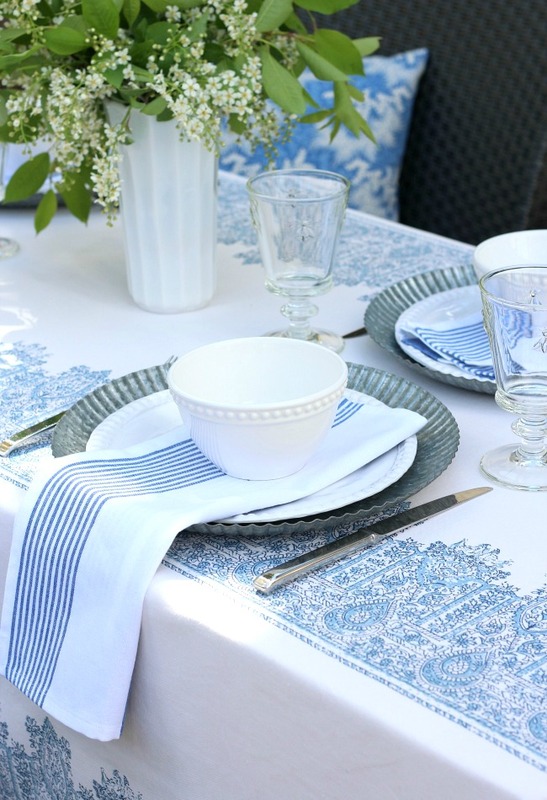 One thing we enjoy immensely over the summer months is outdoor dining. We eat our meals al fresco whenever we can and tend to have family and friends over much more than other parts of the year. Brunch is a favourite, since it’s easy to throw together and has a very casual vibe. Plus, with breakfast or brunch, you don’t have to stay up until the wee hours of the night like you do with dinner parties. These days, sleep is precious! Although we eat most of our family meals on the deck, I prefer brunch on the patio. The morning light in that part of our yard is the most beautiful and sunny and warm. Rather than move our regular outdoor table down there, I use a fold up one I salvaged from my parents’ farm instead. You may recognize it from my flea market style tablescape I put together last May. 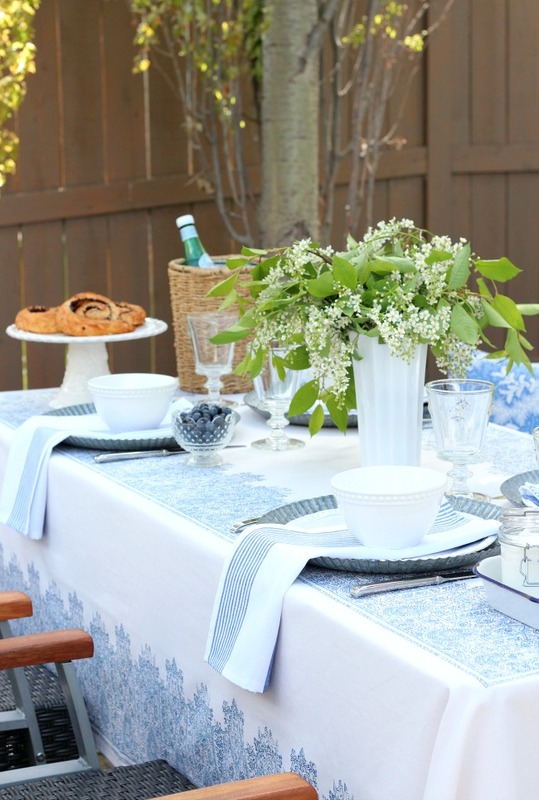 As an option, use a standard folding table and top it with a beautiful table cloth. No one will ever know. Then borrow the chairs from your regular outdoor dining set. 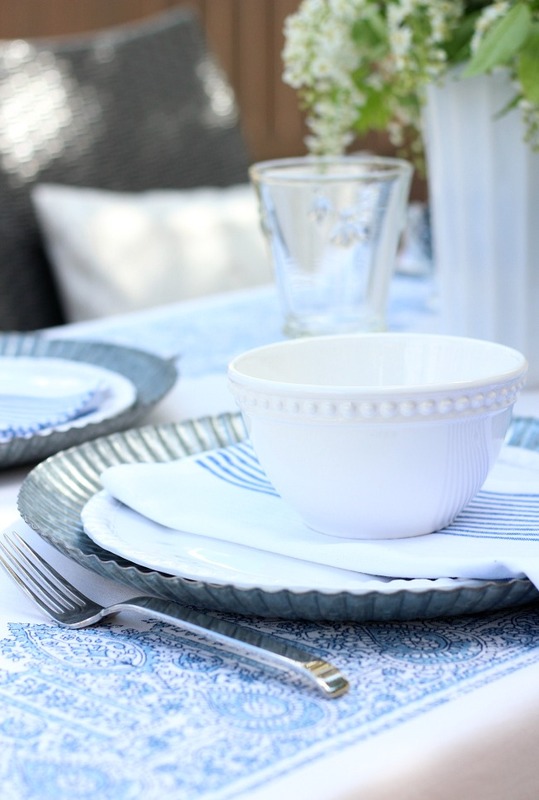 For each place setting, I like to use a textural placemat or charger, then top it with a simple white plate. 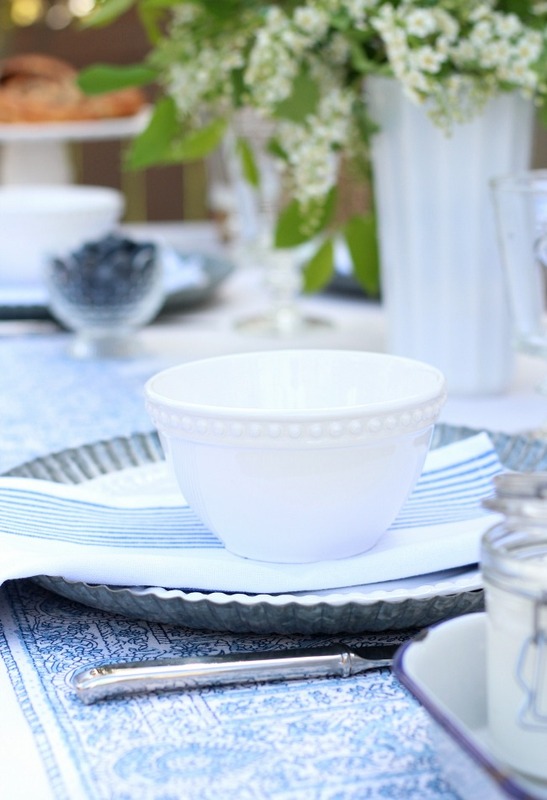 Once you’ve invested in the basics, it’s easy to change the look with different patterned or coloured plates, bowls or napkins. The combinations are endless. 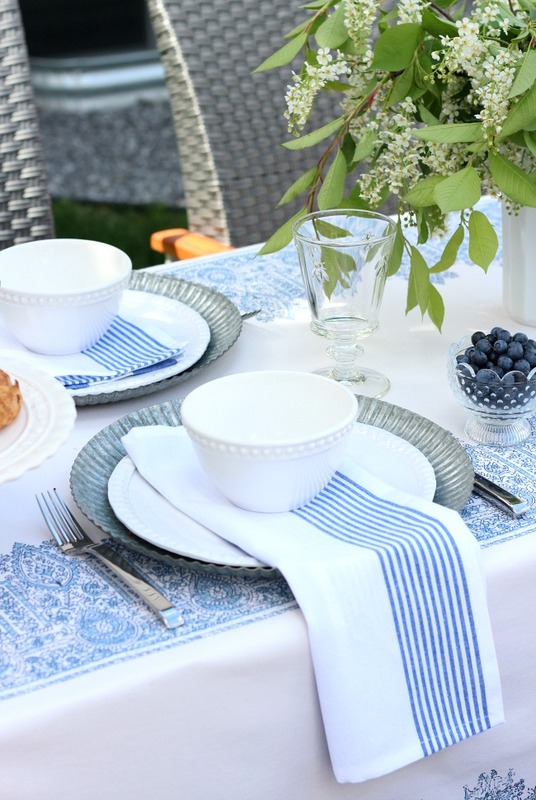 I love how fresh and vibrant the blue and white striped napkins from Wayfair look. Mixing patterns and stripes always seems to work. And those cute little bee stemmed water glasses are perfect for an outdoor table setting, aren’t they? Keep sparking water (or champagne if you prefer) chilled in a container filled with ice. I used a woven planter with a galvanized liner. Look around your house to see what you already have on hand. For the food, keep it simple. Pastries from the bakery warmed in the oven right before serving are always a hit. They’re also a good excuse to pull out your cakestand if you have one. Quite often, I prepare an omelette or frittata the night before, put it in the fridge, then bake it in the morning. That way, I’m not running around trying to get everything ready when our guests arrive. Instead, we can enjoy a relaxing coffee together. 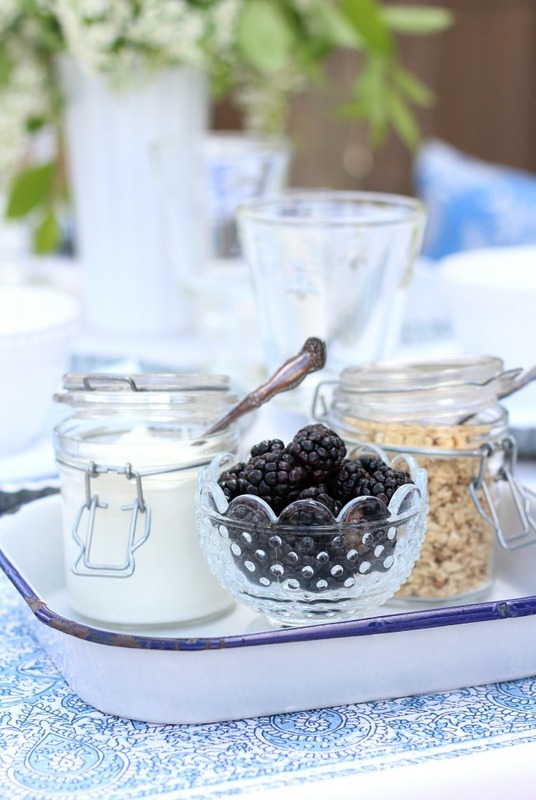 I also fill containers with yogurt, berries and granola so people can make their own parfaits. These yogurt panna cotta jars are another option. Use small trays so items can easily be passed around the table. 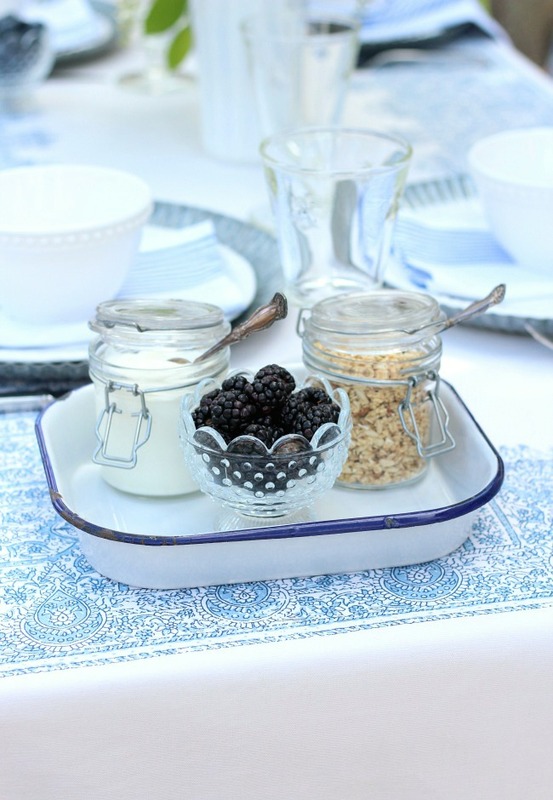 My enamelware trays work great for this and add a bit of a vintage charm to the table too. For the table centerpiece, look around your yard and see what can be clipped. Our chokecherry tree had the most beautiful white blooms, so I couldn’t resist snipping a few twigs and adding them to a milk glass vase. Next time, I’ll use lilies or peonies or whatever is blooming in our yard at the time. 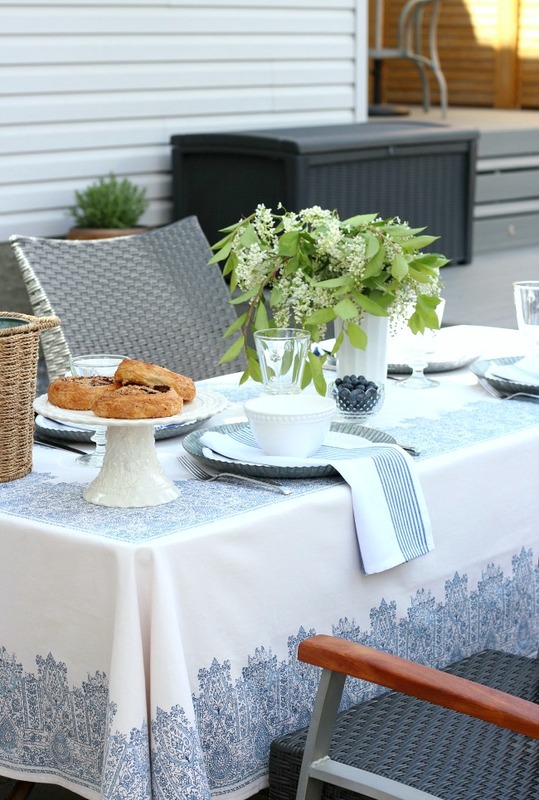 Having different heights and textures on your outdoor table will make it look more interesting, especially if you keep the colours limited like I did. Play around with various decor pieces, then stand back to see how the whole thing looks as a whole. 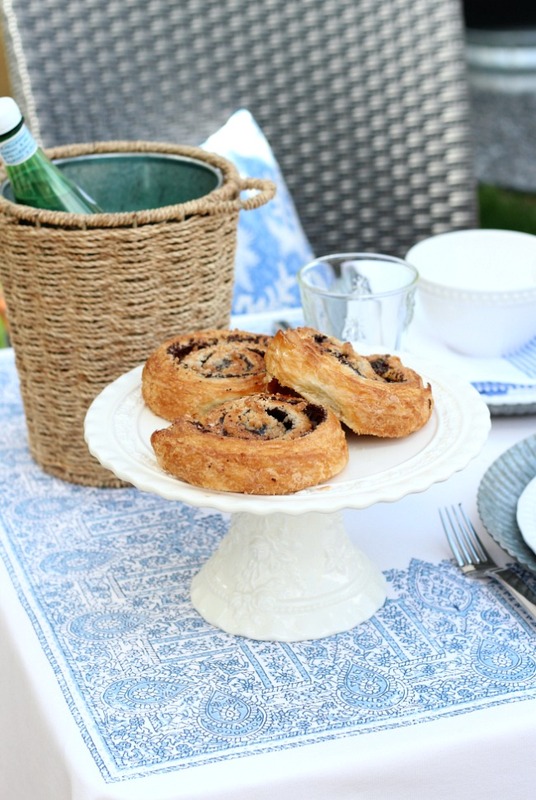 Ready to style your own outdoor brunch table setting? Summer entertaining is all about keeping it casual and fun, so don’t fuss too much. Let go and embrace this wonderful season! Absolutely gorgeous Shauna! I am such a sucker for whites that this is just a treasure to the eyes!!!! And what AMAZING photos! Thank you! White is my absolute favourite! Everything looks beautiful Shauna! 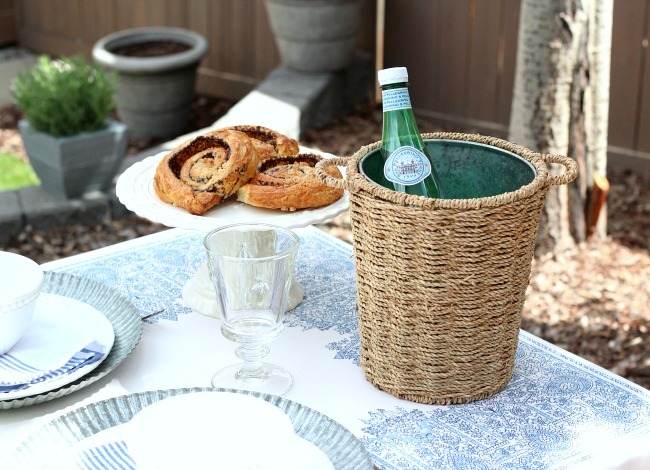 I feel inspired to have brunch on our deck this weekend! Very beautiful Shauna. Love the colors! It’s so beautiful! Perfect for summer, Mother’s Day . . . Easter . . . so many options! Thank you, Amy! We plan on hosting many outdoor parties this summer and will put it to good use. Thank you so much! That table cloth was definitely a good find.